Contributed to Chockstone by Phil Box. Please read the full disclaimer). The following demonstrates a worthwhile jugging technique. The set up is for jug hauling but it works just as well for simple and easy jugging. You've got a jumar [Ascending Device] at the top with a pulley rigged into it, rope goes through jumar and arrives at your harness where it runs through a GriGri, from there it runs back up to the pulley rigged into the jumar and from there the rope runs down to ground. The beauty of this system is that at any time one can simply transfer from jugging to rapping. As you near the top of the jug the rope runs through the GriGri of it's own accord, which is not a bad thing as it makes the jug easier the higher you go. When you sit back into your GriGri it will still lock off as normal. Mind you, as you get higher the jumar gets harder to push up the rope as you are also lifting the weight of the rope through the pulley. One has to hang on to the tail of the rope coming out of the pulley and if you are pulling on this tail you achieve an effective 3 to 1 haul system, brilliant. You'll note that I have the SRT ascender tied in to me directly as a back up and the foot loop is made up to suit me. Therefore people really do need to fiddle around with lengths which best suit them. I am unwilling to advise of lengths for these items. You'll also notice that with the GriGri in combination with the jumar backup there are two points of contact with the rope. 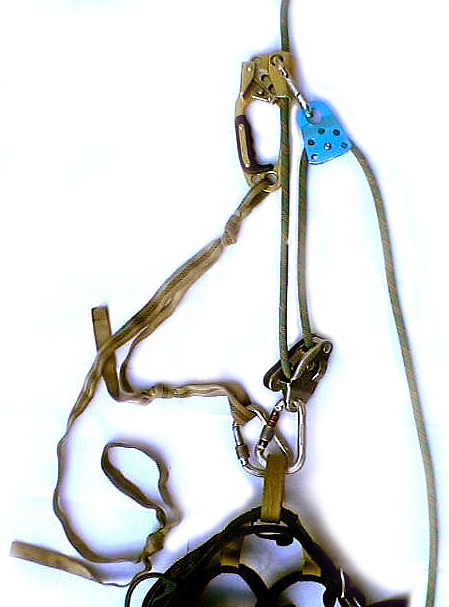 The SRT ascender jumars also have the lockable cam on the rope and the biner through the hole in the jumar also provides a backup so that there is absolutely no way that the jumar can come off the rope even in the most severe traversing situations. When jug cleaning aid pitches as a second it might be a bit fiddly but there are ways around having to unclip the jumar, for instance clip a long draw on to the piece to be cleaned, pull yourself into the piece and unclip the biner attached to the piece from the rope, lower yourself off until weight is off the piece and proceed to clean the piece. Of course on steeply overhanging sections other tricks come into play but that's a whole nuther story. Chockstone Feedback - Discuss this article by leaving comments in an appropriate topic of the forum. 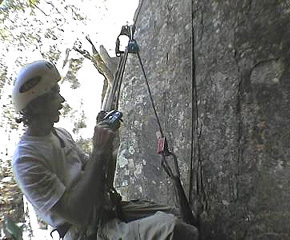 Using A GriGri To Jug Fixed Rope - From Climbing Magazine. How Do I Jug - From Dawn's FAQ on TradGirl web site.